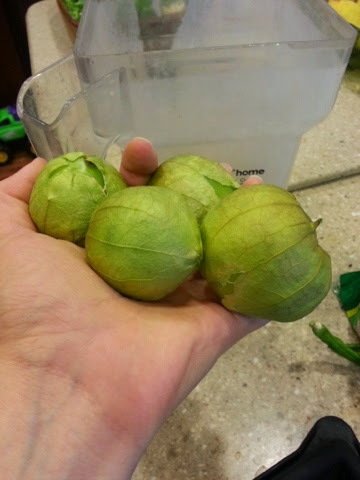 This week we harvested an abundance of tomatillos and serrano peppers. Then, we had leftover pork roast from a Sunday dinner with extended family. Combine the two, and it sounded like enchiladas to me! 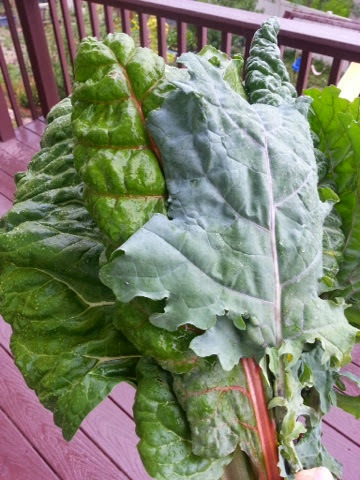 I always have greens available to harvest, so I thought they would work as a good filler in lieu of beans or cheese. 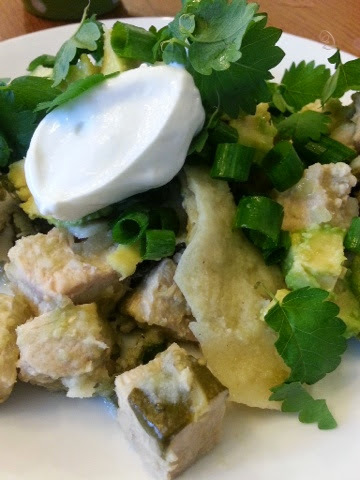 My teen pointed out that most of the ingredients for the enchiladas were green, thus the enchiladas would be super green. Wash the leaves and remove stems. 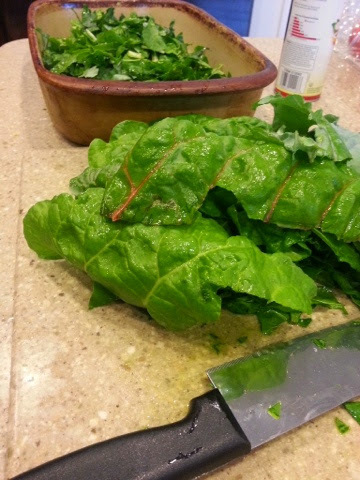 Chop leaves into one inch pieces. 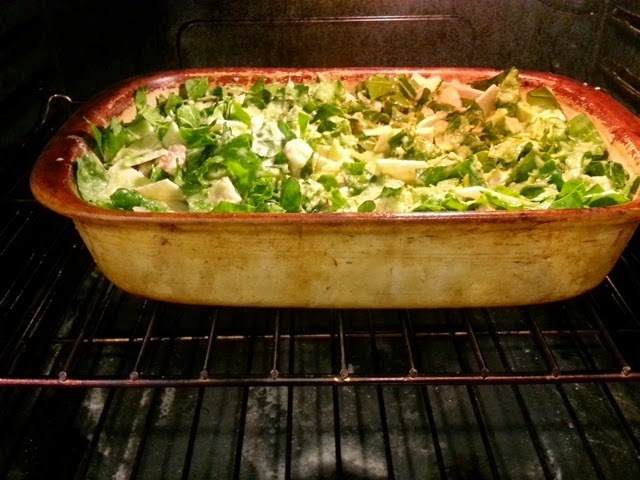 Place in greased or sprayed 9×13 baking dish. 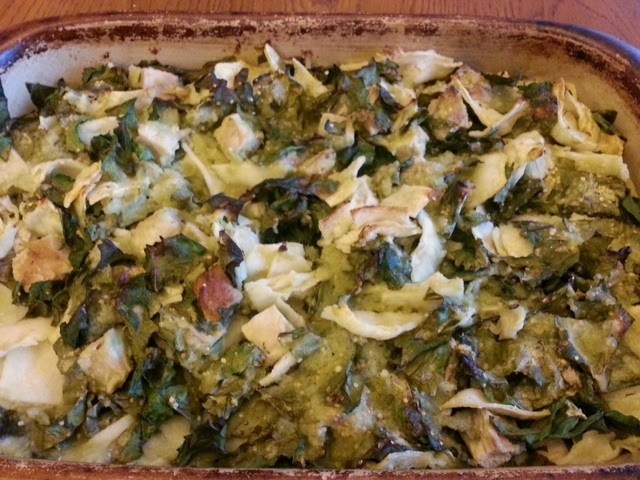 Any leftover cooked meat would work for this casserole. I used leftover pork roast, about 1 1/2 lbs. 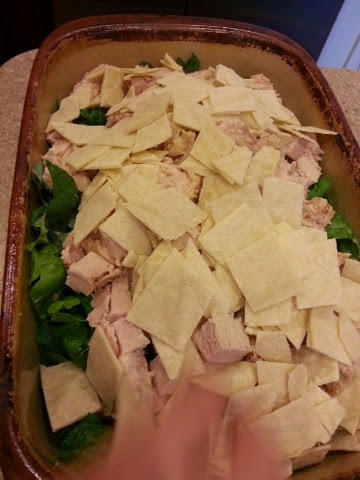 Cut into 1/2 inch cubes and place in baking dish. 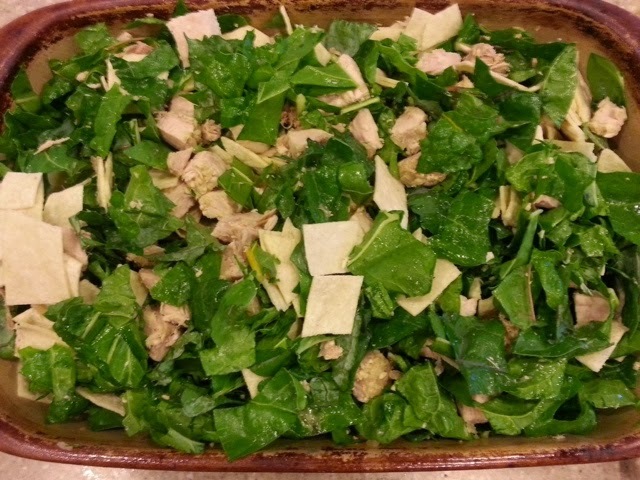 Stir the greens, meat and tortilla pieces to combine. 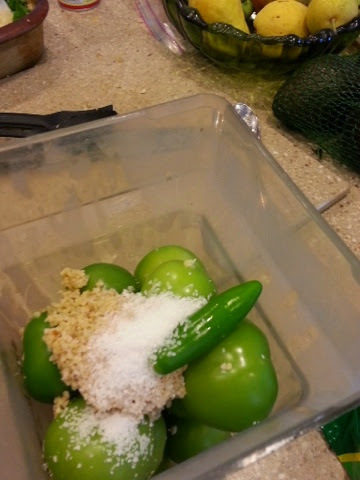 Now it is time for the tomatillo sauce: remove the husk and wash enough tomatillos to fill the blender. We probably used 15-20. 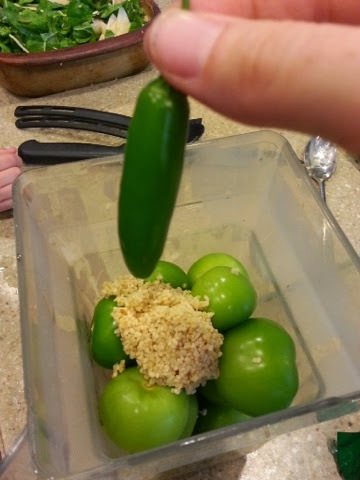 Then add one serrano pepper for a slight heat in the finished enchiladas. Or add two if you like it spicier. Or add one for the children and non-heat-seekers in the family and serve extra sliced serranos for those members of your family who like it spicy. This was the option we went with when hubby said the enchiladas were bland for his heat-seeking tastebuds. 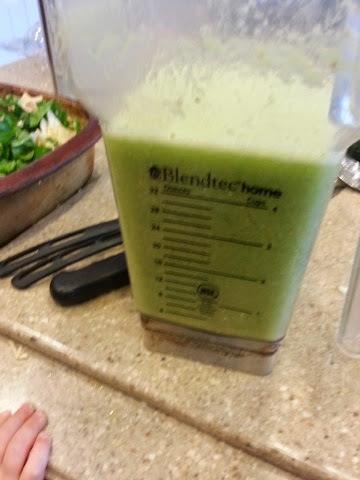 Add about 4 ounces of water to help things blend. Blend away! After our first blend, the blender jar was down to 2/3 full, so we filled it again with 6-8 more husked, rinsed tomatillos and blended a second time to get a jar full of sauce. Taste and adjust for seasoning. 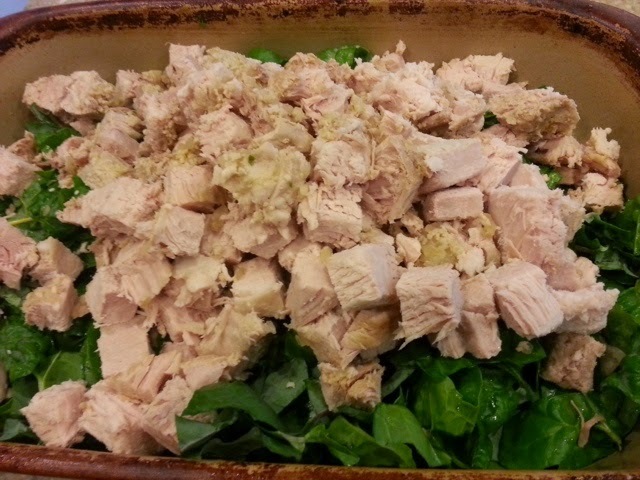 Ours was delicious, tangy, hint of heat, and ready to go on the casserole. Pour evenly over the mix in the baking dish. While it is baking, return outside in the rain to harvest toppings! 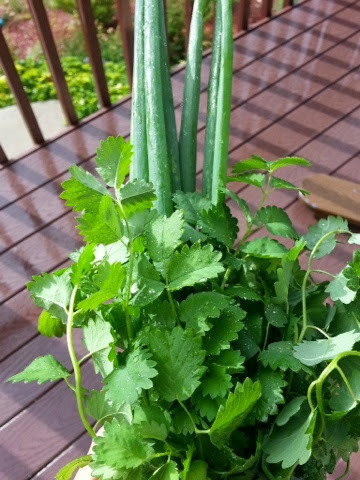 I picked green onions and salad burnet (a perennial herb with frilly leaves and a light cucumber flavor.) Cilantro would be another good topping. 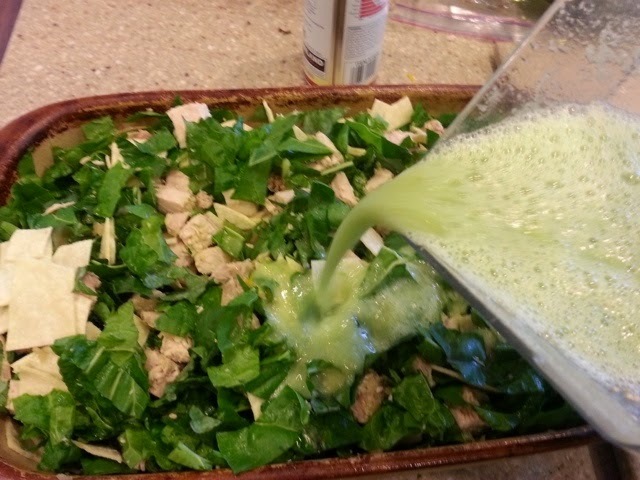 As it bakes, the greens in the casserole wilt down nicely and the whole thing comes out bubbly and smelling wondeful! 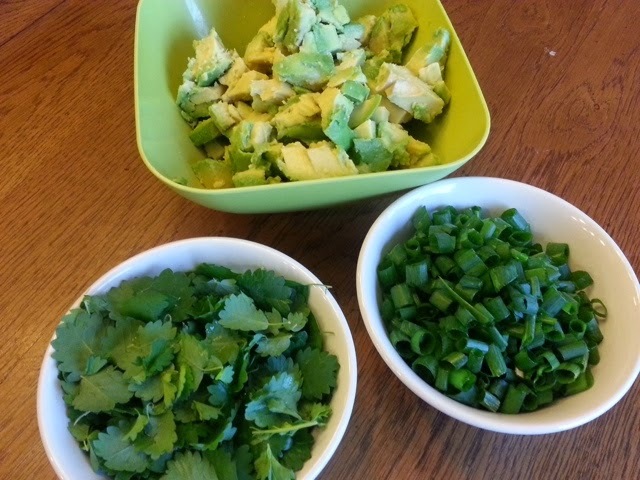 In addition to the green onions and salad burnet, we diced avocado to top on our casserole. This entry was posted in Household.